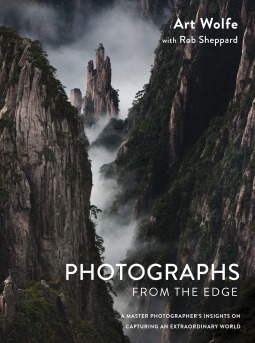 Photographs from the Edge: A Master Photographer’s Insights on Capturing an Extraordinary World by Art Wolfe, Rob Sheppard, which will be published in September 2016, is stunning. Wolfe is a clear talent at capturing nature, tribes, and animals and his composition is unique and lively. It’s clear that the equipment he uses and his forethought about the scene enable him to capture even unexpected beauty. Rather than work as a career photojournalist, he has taken a harder, more independent path. While this has left him to be creative and take on projects that others might not, it also has some consequences, such as not being in his home more than he is on the road. However, it is a choice he never regrets, and readers will see why when they view the phenomenal images in this book. His love of photography is infused in every picture he takes, and it is these pictures that enable us to put ourselves in different locations and view them as they are, without industry and interference from the modern world. Even photos at a distance are created with composition, lighting, and subject in mind. It is clear that he loves what he does, and he equally loves the subjects, shining a new light on even the ones most photographed, like penguins. Photographs from the Edge: A Master Photographer’s Insights on Capturing an Extraordinary World by Art Wolfe, Rob Sheppard is a book that everyone will want to have in hardcover to cherish Wolfe’s art — to hold it, to view it up close, and to reach inside and experience the world through his eyes. The son of commercial artists, Art Wolfe was born in 1951 in Seattle, Washington, and still calls the city home. He graduated from the University of Washington with Bachelor’s degrees in fine arts and art education in 1975. His photography career has spanned five decades, a remarkable testament to the durability and demand for his images, his expertise, and his passionate advocacy for the environment and indigenous culture. During that time he has worked on every continent, in hundreds of locations, and on a dazzling array of projects. You can view his stunning photographs online and buy. 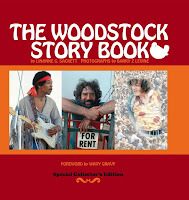 The Woodstock Story Book by Linanne G. Sackett and Barry Z. Levine is much more than photographs of the infamous peace concert called Woodstock. It’s a chronicle of the festival from its inception to its completion. Levine’s images are immediate, palpable, and candid, while Sackett’s storytelling is clipped, providing only the essential details readers will need to grasp the photos before them. The foreward, written by Wavy Gravy, discusses the nostalgia he felt after seeing the book in its completion, and he notes that even though the outdoor festival ended, the principals and dreams of Woodstock live on. Through poetic lines, The Woodstock Story Book tells a lyrical account of the days leading up to the festival, the struggles with locating a large enough venue, and the community created in just a few days. The festival’s stages were not even completed before the crowds started arriving. Check out this crowd shot from Barry Levine’s Web site. The Woodstock Story Book is an essential photographic history of a tumultuous time in our nation’s history. This 40th anniversary, collector’s edition provides readers with a backstage pass to the best outdoor event in our nation’s history. Even after 40 years, the Woodstock experience in Bethel, New York, between Aug. 15 and Aug. 18, 1969, continues to capture the imagination. With never-before-seen photos of Jimi Hendrix, Janis Joplin, Jerry Garcia, and more, The Woodstock Story Book tells a chronological story of the music festival that became one of Rolling Stone’s 50 Moments That Changed the History of Rock and Roll. There are over 300 full-color photographs in this book and are accompanied by humorous descriptions of the festival. Great for those who remember Woodstock, wished they had been there, or are interested in rock and roll history. 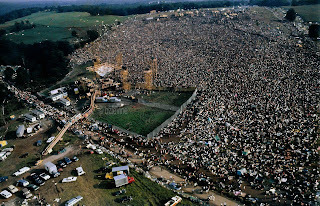 For more information, check out The Woodstock Story Book blog. Thanks to Lisa Roe at Online Publicist for sending me the book to review. 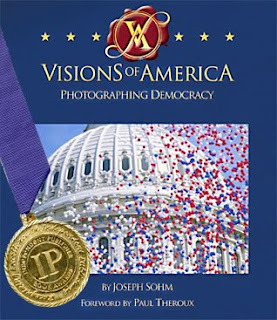 Visions of America by Joseph Sohm is more than a collection of photos about democracy, it is one man’s journey across America to find democracy and reconnect with his nation. Amidst the photographs Sohm intersperses our nation’s history and the emergence of our very own icons–the bald eagle, Mount Rushmore, the American flag, and more. And one point in this “travel” journal, Sohm says, “Maybe the point in photographing icons of democracy is more about seeking perfection than finding it.” (Page 7). Not only are the photos gorgeous, the essays are poignant and informative about his journey and our nation’s history. Visions of America is a coffee table book for guests to peruse while dinner is cooking, for friends, family, and neighbors to ogle and discuss. This book compiles some of the most breathtaking images of our nation’s countryside, our icons, and our people from all walks of life. Each page is laid out in a variety of ways from large images with superimposed images of birds and famous quotes from former presidents and others. One of my favorite tidbits from the book is when Sohm talks about how he got out his trusty Mr. Clean and paper towels to wash down the New Hampshire welcome sign for its photo shoot. There are a series of panoramic photos throughout the books from the WWII Memorial in Washington, D.C., to landscapes in Utah, Alaska, and California. Countrysides, cityscapes, everyday men and women, and communities pepper this volume and celebrate democracy in a variety of ways. Readers eager for a break from traditional reading pursuits should consider picking up this beautiful volume of our American heritage. There are only two possible drawbacks to this book–the cost of $75 and the heft of the book itself. You won’t be carrying this one around on the subway. 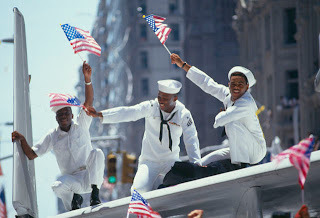 Photographers–amateur and professional–will want to add Visions of America to their collections. However, Sohm has a great eye for what makes this country great and his photography and essays are a testament to our nation’s grandeur. Please check out the video interview with Joseph Sohm and a Photo Symphony. 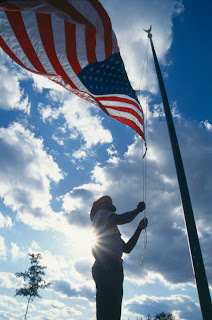 Don’t forget the Visions of America Web site. Stay tuned for my interview with Joseph Sohm next week. Thanks to Joseph for sending me this beautiful book and for providing me with the photos for this post. All photos are copyrighted by Joseph Sohm and cannot be reproduced without permission. Have you ever wanted to visit Las Vegas, Nevada? My husband and I visited Sin City 2 years ago in August; boy was it hot. Anyways, I took a bunch of photos, and one of those photos was accepted for online publication in SCHMAP!! Las Vegas The photo selected was for The House of Blues! Click on the link to check out my photo and the rest of the interactive map, which you can use on your iPhone and other electronic devices. Please take a look at this slideshow and tell me which photo you prefer. Please leave your selection, either by number as it appears in the slideshow or by title of the photo, in the comments. 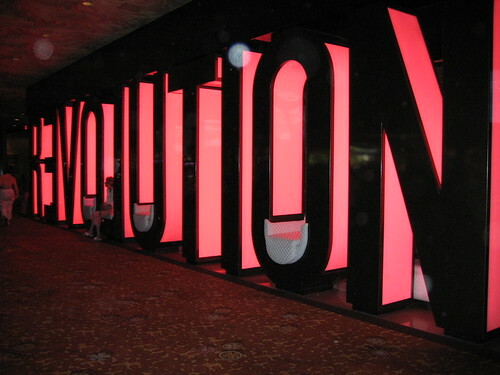 Thought you all might like a change of pace, so I am sharing with you one of my photos from Las Vegas. The Beatles Lounge. As some of you already know, I have published poetry in online journals and print journals alike, but I have now branched out into photography. My first photo, In Flight, is published online in the Sept./Oct. Issue of All Things Girl. I encourage all readers to check it out. I’m very excited as you can tell. I will have another photo in their upcoming issue for Nov./Dec. as well. I’ll remind everyone once the issue is online. Friday night’s photography show at Gallery F64 was a small and intimate affair in Ellicott City, MD. It was great to see an old favorite of mine, Cottage View, by Jamie Berman as part of the exhibit. I love his reflective pieces, which he has done quite a few of over the years. There were two others I had not seen before, though I may have given my mind is faulty sometimes. He had three photos in the gallery this time around, which is pretty good for someone just starting out, I think. It was great to see the work of other photographers in the region as well; some of whom were on hand as well. The other emerging photographers featured in the gallery exhibit include: Ben Cricchi, Antonio Paterniti, Bob Paulding, and Brenda Fike. Unfortunately, I could not find a site for Mr. Paterniti, but here are a Field & Stream photo and a National Geographic photo. I figured I would add a blog about photography, since I have been promising a balance between poetry, writing, and photography, which are my passions. Enjoy the emerging photographers. For some inspiration, a new photo to spark a new poem or idea for a story. I expect you all to post your progress. I will attempt to write one as well.